For the American hard rock band, see Mountain (band). A mountain is a large natural rise of the Earth's surface that usually has a "summit" (the name for a mountain's top, which can also be called a peak). It is usually steeper and taller than a hill. Mountains are often thought of as being a hill which is larger than 600 metres (about 2,000 feet). However, some definitions say a mountain is a hill larger than 300 metres (about 1,000 feet). The highest point of a mountain is called the peak. A mountain's summit is the highest area an individual can reach. A mountain climber will not reach the peak of the mountain but can reach the summit. Britannica Student Encyclopedia says that the term "mountain" usually means a rise of over 2,000 feet (610 m)". Polytechnic Student Encyclopedia says that the term "mountain" usually means a rise of over 1,000 feet (300 m)". The standard height for a mountain in England is 600 metres. In England, this is important because in English law people have the "Right to Roam" in mountains, but they do not have the same right to walk on someone-else's land. Fold mountains occur when two plates collide. The less dense continental crust "floats" on the denser mantle rocks beneath. The continental crust is normally much thicker under mountains, compared to lower lying areas. Rock can fold either symmetrically or asymmetrically. The upfolds are anticlines and the downfolds are synclines. The Jura Mountains are an example of fold mountains. Folded mountains make up some of the highest mountains in the world. Folded mountains commonly form along boundaries, where 2 continents meet. Some really complex folds are in parts of the Andes, Alps, Himalayas, Appalachians, and Russia's Ural Mountains. These long mountain chains also show lots of signs of folding. Block mountains are caused by faults in the crust: a seam where rocks can move past each other. When rocks on one side of a fault rise relative to the other, it can form a mountain. The uplifted blocks are block mountains or horsts. The dropped blocks are called graben. They can form extensive rift valley systems. This form of landscape can be seen in East Africa, the Vosges, the Basin and Range province of Western North America and the Rhine valley. These areas often occur when the regional stress is extensional and the crust is thinned. at a mid-ocean ridge or hotspot. At a depth of around 680 kilometres (2,230,000 ft), melting occurs in rock above the slab (due to the addition of water), and forms magma that reaches the surface. When the magma reaches the surface, it often builds a volcanic mountain, such as a shield volcano or a stratovolcano. Examples of volcanoes include Mount Fuji in Japan and Mount Pinatubo in the Philippines. The magma does not have to reach the surface in order to create a mountain: magma that solidifies below ground can still form dome mountains, such as Navajo Mountain in the states of Utah and Arizona, in the United States. Volcanic mountains form when molten rock erupts onto the Earth's surface. They can either form on land or in the ocean. The Cascade Range in Washington, Oregon and northern California is made of volcanoes. Some of the largest volcanoes are on divergent boundaries, which form the mid-ocean ridges. The mid-ocean ridges have big volcanic mountain chains that run through the Atlantic, Pacific and Indian Oceans. The mountains in the mid-ocean ridges can grow tall enough to create islands such as Iceland or the Azores. Other volcanic mountains form over hot spots, pockets of magma beneath the crust which erupt onto Earth's surface. The Hawaiian Islands are the tops of really high volcanic islands that have formed over a hot spot on the sea floor. The main Hawaiian island is a volcano about 98 kilometres (322,000 ft) above the ocean floor. Its base is about 680 kilometres (2,230,000 ft) wide. Almost 48 kilometres (157,000 ft) of this island is above sea level. Dome mountains, like those in the Black Hills of South Dakota and the Adirondack Mountains of New York, are an unusual domish type of mountain that is formed when molten rock rises through the crust and push up the rock layers above it. This creates a circular dome on the Earth's surface. The molten rock later cools off and forms hardened rock. When the pushed up rocks are worn away, the hardened rock is shown. This hardened rock then wears away in places. When it wears away, it leaves mountains, and they are called dome mountains. Plateau mountains are formed a bit like folded mountains. They are large areas of flat topped rocks that have been lifted high above the crust by continental plates. Most plateaus are near folded mountains. The height of a mountain is measured as distance above sea level. The highest known mountain in the Solar System is the Olympus Mons (27 km high) on Mars. The highest mountain in the world is Mount Everest (8,848m)which is in Nepal and Tibet, in Asia. The "tallest" mountain in the world is Mauna Loa, in Hawaii. The "height" of a mountain is measured from sea level, but the "tallness" of a mountain is measured from its base, even if under water. 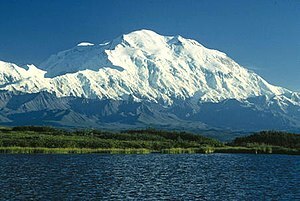 The highest mountain in North America is Mount McKinley (6,194m) in Alaska in the USA. The highest in South America is Aconcagua (6,962m) in Argentina. For Africa, it is Kilimanjaro (5,963m) of Tanzania. In Europe, the highest mountain is in Russia called Elbrus (5,633m). Antarctica's highest mountain is Vinsin Massiff (5,140m). In Oceania, a mountain called Puncak Jaya (5,030m) is the highest there. This particular mountain is in Papua New Guinea / Indonesia. ↑ "Mountain -- Britannica Student Encyclopedia". Retrieved 2007-01-08. ↑ "Mountain -- Polytechnic Student Encyclopedia". Retrieved 2012-08-08. ↑ Press, Frank; Siever, Raymond (1985). Earth (4th ed.). W. H. Freeman. p. 413. ISBN 978-0-7167-1743-0. ↑ Ryan, Scott (2006). "Figure 13-1". CliffsQuickReview Earth Science. Wiley. ISBN 0-471-78937-2. ↑ Butz, Stephen D (2004). "Chapter 8: Plate tectonics". Science of Earth Systems. Thompson/Delmar Learning. p. 136. ISBN 0-7668-3391-7.